Eat Your City: Old Strathcona's Farmers' Market, Edmonton, AB - eating local, so much tasty food fun! 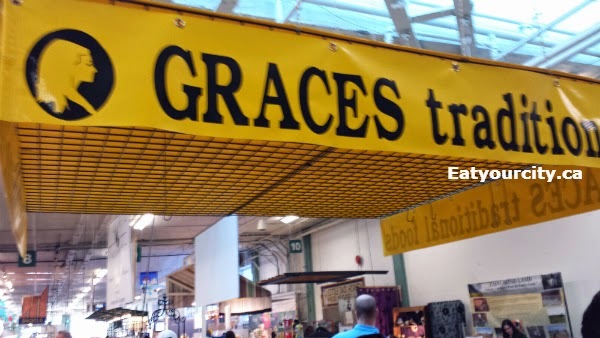 Old Strathcona's Farmers' Market, Edmonton, AB - eating local, so much tasty food fun! On a recent Saturday morning a while back when we attempted to drive down to Calgary, we were thwarted by the weather which dumped about a feet of wet snow everywhere. So we ended up running a few errands downtown, and hit up Strathcona's Farmers market right when they opened at 9am (yeah, we were up pretty early that day). 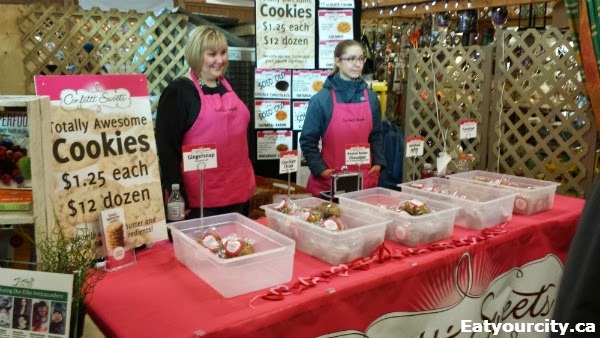 We joined a surprisingly large number of families and couples wading through the wet snow (which practically all melted by the time the afternoon rolled around) to browse, shop and eat at the farmer's market. Onto the food fun! 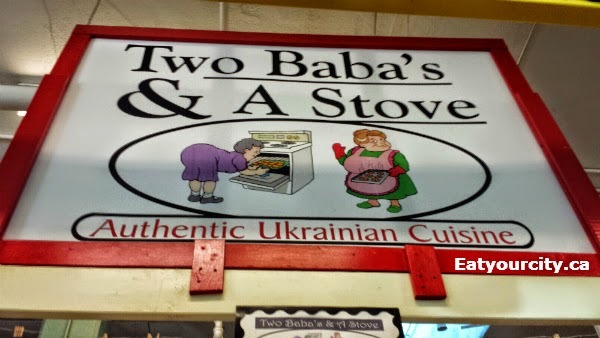 Our first stop was to pick up some deliciously soft perishke (think little bun) and a super indulgent dill cream sauce to bake it in from Two Baba's and a Stove, run by owners Angie and Tim Wiltzen who started selling these popular Ukrainian treats over 10 years ago. Yum! They also sell perogies, cabbage rolls and Nalysnk, but we wanted to save some freezer space for other vendors. 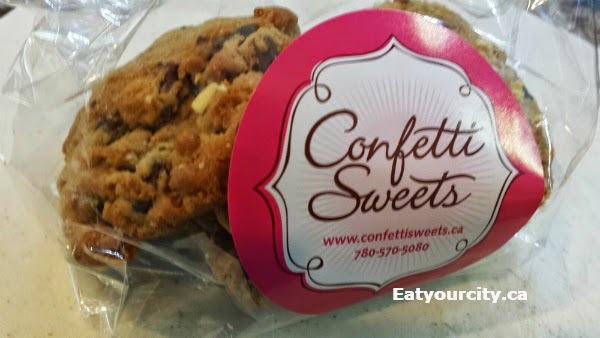 Our next stop was Confetti Sweets, which had a spot in the limelight as they provided cookies and sweets to the Canadian Country Music Awards in the fall of 2014, and at the Oscars this year. 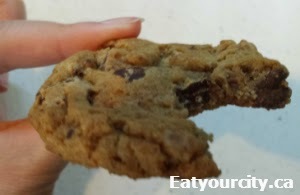 Peanut butter and chocolate chunk cookies - these ones I loved. Lots of creamy peanut butter interspersed with melty chocolate chunks. Yum!! Ginger cookies - soft and mild in ginger flavor with small bits of candied ginger throughout. Fiancé prefers knock your socks off ginger flavor, but I liked these too. We then stopped off at Theo's Greek Kouzina and picked up some frozen moussaka to try. I haven't had a homemade moussaka (think lasagna but with layers of roasted eggplant, cheese, meat, potatoes and a bechamel white sauce) since we were in Greece years ago on a month long trip. I ate plenty of moussaka along the way, and hopefully it'll live up to the best I've ever had - a wonderful YaiYai (grandmother in Greek) who lived in and around the mountainous area we were exploring, invited us into her home when we followed our noses literally to her doorstep. Picture when I get around to baking it. After browsing at the various fruits and vegetable stalls, we hit up Hendrickson Bagels for some delicious pepperoni stuffed rolls, made with the same dough used for the bagels. The white bread version was tasty, but the tender soft and flavorful whole wheat version studded with some cracked wheat the was bomb. We nuked them for about 10-20s to eat them warm. Mmm! 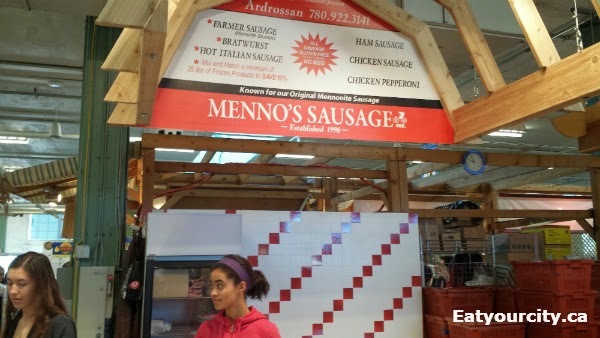 We then stopped off at Menno's Sausage for some old fashioned style Mennonite sausage! We picked up the ultra lean garlic sausage and saved the bratwurst, hot Italian sausage, ham sausage, ham garlic sausage, chicken sausage and chicken pepperoni (which is gets pretty close to the regular pork version in terms of flavor and texture!) for next time! Then it was off to Grace's Tradition for some fabulously garlicy and lean triple garlic ham sausage. She also sells Polish ham sausage, pepperoni, beef jerky and poppy seed rolls. Our last stop was Marina's Cuisine, where we sampled some delicious Russian pelmeni (meat dumplings) generously packed with seasoned meat encased in a thin wrapper. We ran out of cash by then (and I didn't have enough freezer space at home for half the stuff we picked up today lol), but the lovely lady manning the booth was super friendly and told us she was glad we came out to the market today. Hours open year-round every Saturday from 8am-3pm.